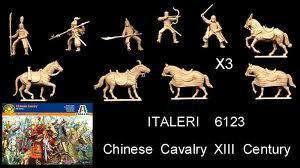 Time to speak of a quite recent set, the refreshing Chinese Cavalry from Italeri. 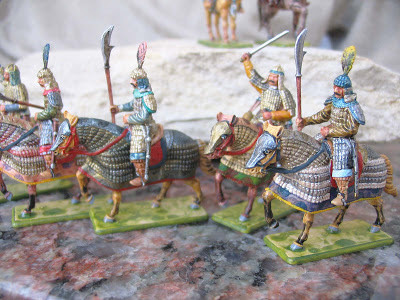 A much needed set, or just oversized Mongols? Find out! It's a good box, full of life, maybe the composition is a bit chaotic, and the colour tones are a bit light, but overall it is good. In the back pic we come back to Italeri bad practices, where we are shown a figure that it would be very nice to have and it is not in the set, and I ask, why on earth? I want to know how to paint a figure I don't -and I can't- have? Okay, it resembles the archer, but he neither wears armour nor the same hat. Also, the man with the winged helmet is not so impressive. He has its wings molded on to the helmet, and I would have liked him to have had this pose. So the box art is actually better than the figures. 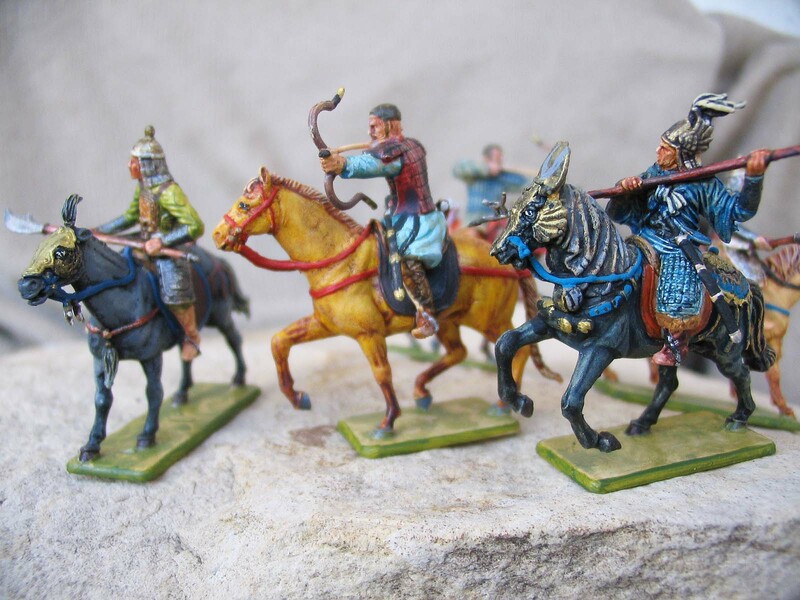 Here there is very fine sculpting, (fine arrows perfectly represented), no flash at all, quite good poses for the horses, and plenty of detail everywhere, and the weapons are perfectly represented. But (and this is a but of epic proportions) these men are gigantic! 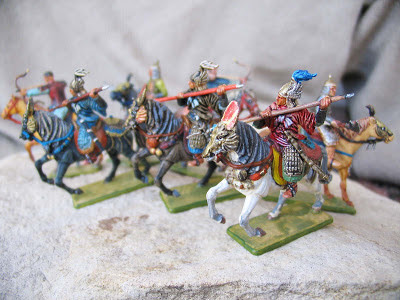 hey are big for 1/72 men, and gigantic for 13th century Chinese. 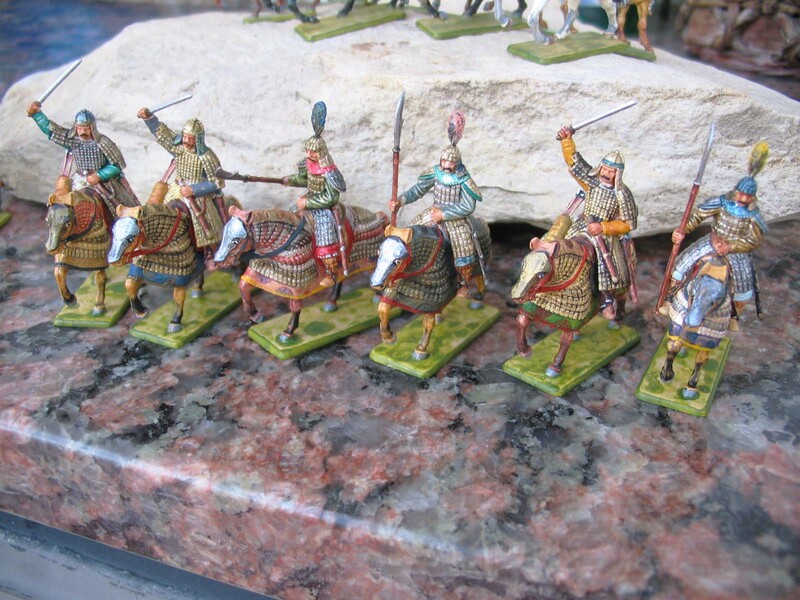 They are even very big compared to other Italeri sets, and even comparing them to the most recent Italeri sets (you could say they are in a new style of the company which makes the figures bigger and taller) ,they are as tall as dismounted soldiers of other nationalities. I can normally overpass this common evil of new figures, for example, the Gothic Cavalry they are tall and big also, and the Arab Warriors but some of these are even taller than them, and it just seems very wrong for Chinese. He is, without stand and flexing his knees, taller than the Caesar Lybian, and only slightly than the Italeri Italian Artillery Officer. Give him a stand, make him stand up, and he'll conquer the 1/72 world! The horses also, don't look like nomad horses, which would be the primary source, but european heavy and big horses. Probably they had some big horses, but it doesn't look right. And the horse without armour seems bigger than horse with armour. 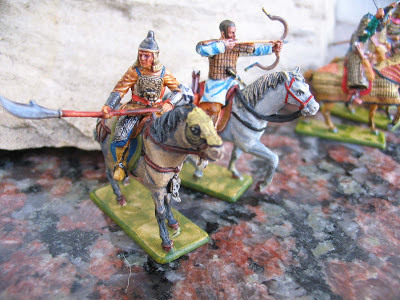 I could still maybe overcome this with very good painting, but we come to the faces, and they don't look like Chinese! There are and there were many racial groups in China, but these men could only pass as half-arabic men of the western frontier. If the set didn't have much detail, it wouldn't be a problem, but the faces are there and they are nicely defined. Italeri has done Mongols before (set 6020, don't confuse with reissues of Zvezda nor Italeri Mongol Cavalry set 6124) with perfectly oriental faces, so I don't understand why they now haven't been able to do it right. 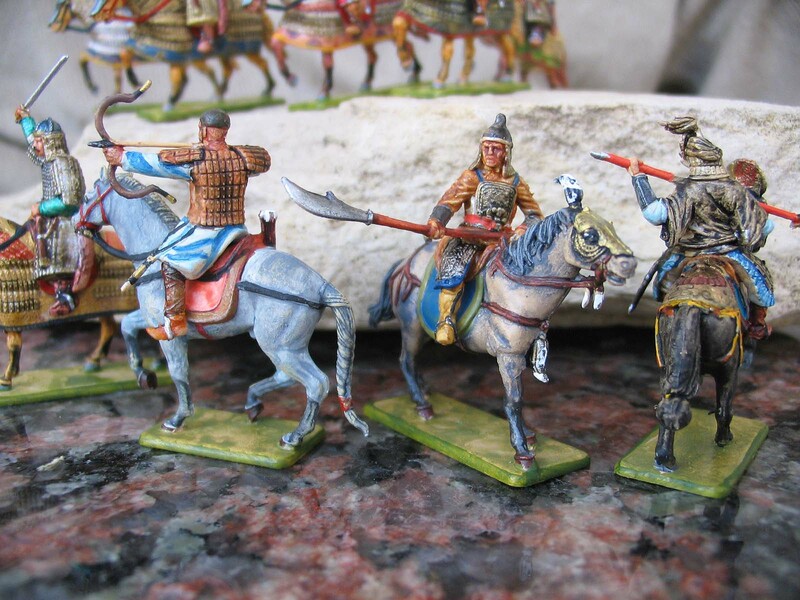 There has been a good work of research, and the Chinese culture has left us many examples of the warriors. 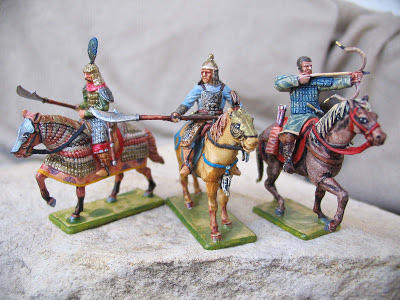 The only flaw I see is that these men should be labelled as "Chinese Heavy Cavalry", as they all wear armour, which would be most surely in nearly all kingdoms reduced to few men, not the 100 %. Besides making all of the different Chinese kingdoms, with some modifying they could be Japanese, or just more Mongols or late nomadic tribes if you still don't have enough of them. 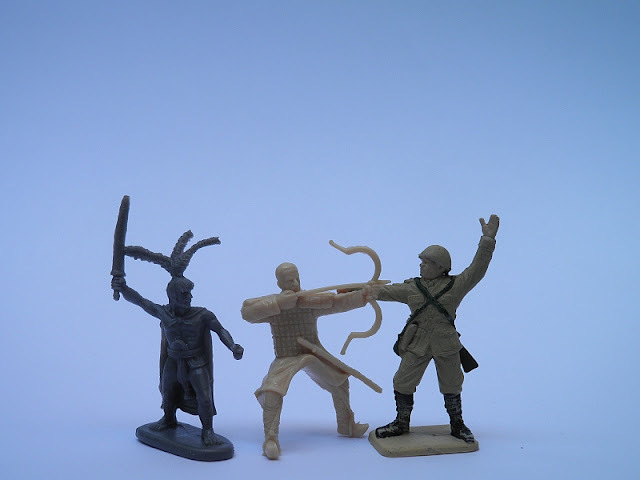 All of the poses are more or less active, with two passive men and the others engaged in combat. We lack really more poses here. 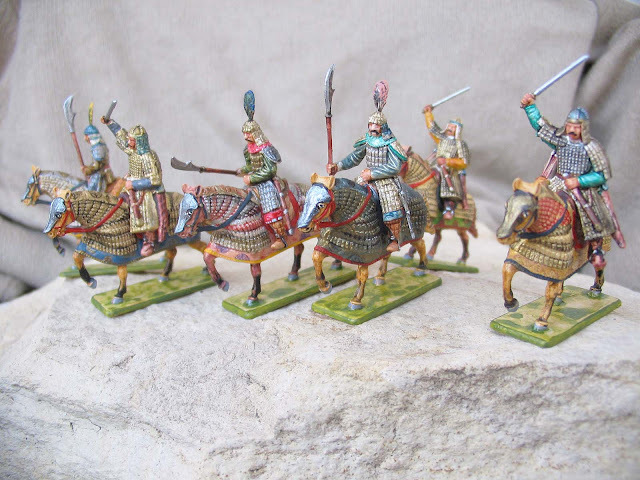 The unique style of weapons of the chinese and horse decorations gives them a special touch however. 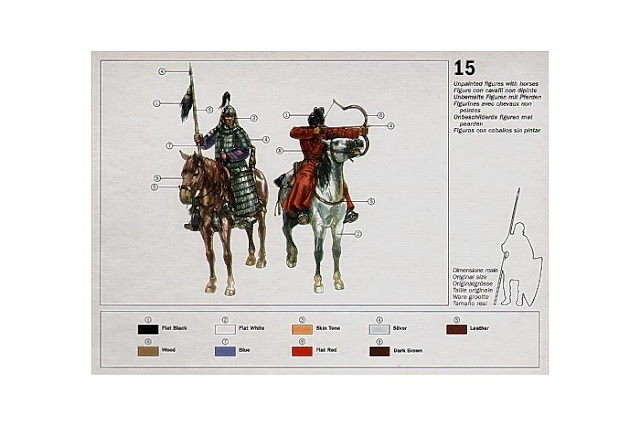 No unique leader, no flag bearer and no musician, this is a very regular army set. With a bit of easy conversion you could get a General, using the head with a feather over the body of the man with sword. The 15 men are much better than 12 for wargaming purposes. 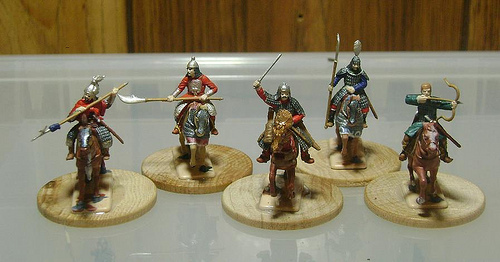 Roughly 8 GBP shipped is the price, for 15 cavalry men is good. On retail stores you could maybe get it at a better price too. As the figures are very big, the positive point is that it will give you a sensation of having better invested your money !) . Please, if you like this review, make a click on the ads! This will help me buying a new computer, paying each month the internet bill, and buying sets which I will review and paint for you!:) . They are made with a semi-hard plastic, which is really adequate for painting them. It also works well with glue. The details are sharp everywhere, and this makes painting them a very easy task. A very good set spoiled by huge dimensions, probably the set I have in my collection in which this aspect is the most annoying, and I combine sets of all diferent manufacturers. Some people maybe won't notice too much, if you only collect later Zvezda and Italeri figures, they would more or less blend in correctly. 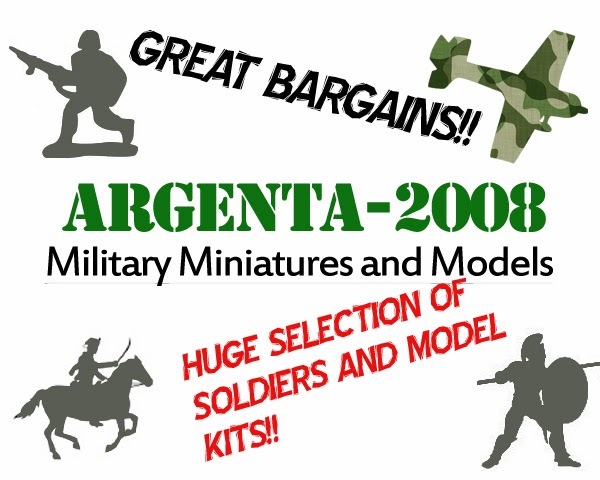 But if you think that the true 1/72 is Esci, and you collect all manufacturers such as Hat, Caesar, Airfix, early Italeri, early Zvezda, etc, you maybe will think twice before buying them. 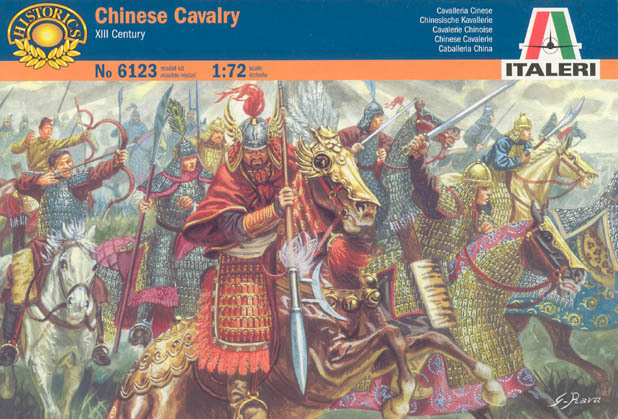 One of the strong points of this set is that it has no competion- no other medieval Chinese Cavalry are available on the market. 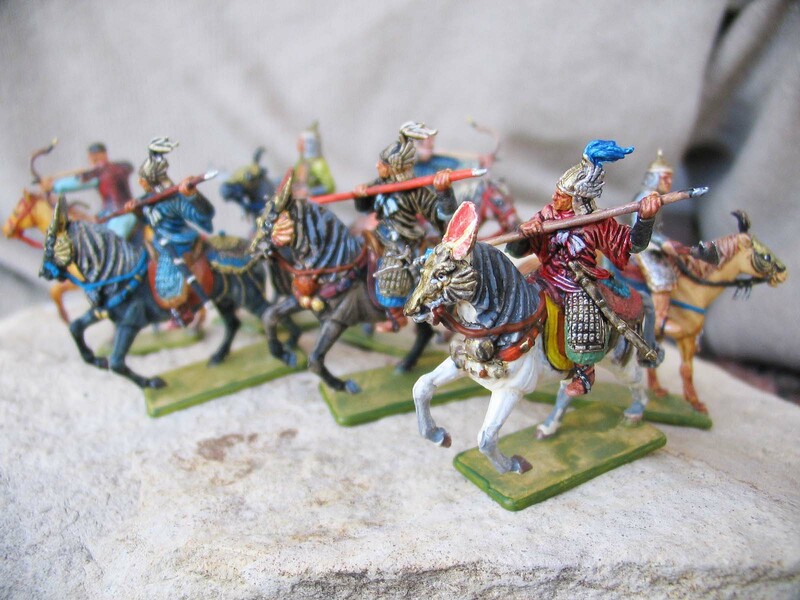 The weak point is that there are no Chinese infantry for this period either,so you willl need to modify some late RedBox infantry 16/17th century to do the job, or get a Caesar set, and both would look as dwarves compared to these cavalry. Plus you'll also need light cavalry, and you would need to modify Italeri Mongols to do the job. 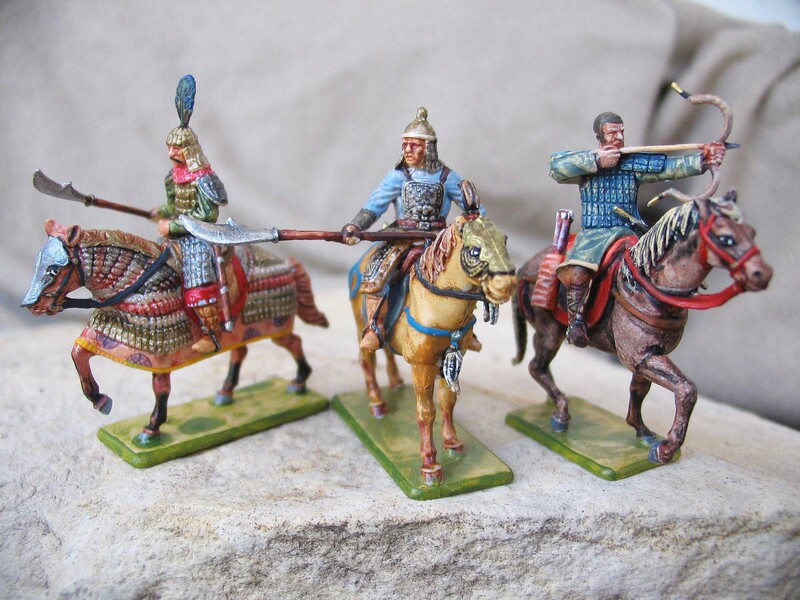 This leaves this set a bit alone in history, besides fighting on their own against Mongols, or some frontier-war against muslim kingdoms which you would have to get by modifiying too. 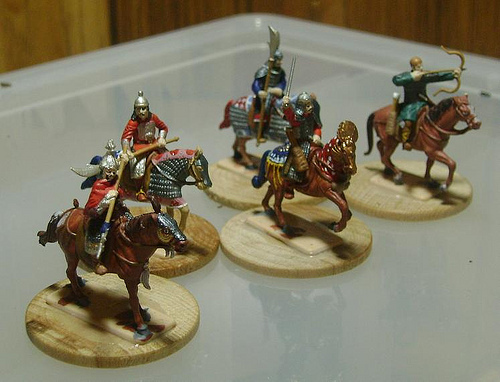 Thanks to Miniaturas Aconcagua for the permission to use his nicely painted miniatures. 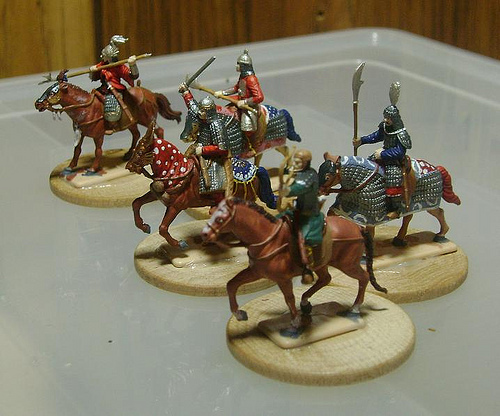 Thanks to chuckster from Benno's Figure Forum for giving permission to show his beautifully painted miniatures. Make any comment! We´ll love to read it! 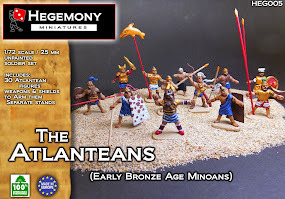 If you want to share your painted version of this set, send a email to tam_cob@hotmail.com with the subject "Painted Soldiers" and I will include them in this post.